BENTONG: With a slew of infrastructure projects in the works, Bentong is set to be a satellite town of Greater Kuala Lumpur. Transport Minister Datuk Seri Liow Tiong Lai said the East Coast Rail Line (ECRL) and the Central Spine Road (CSR) were two major projects which could transform Bentong. “These projects will not only develop the east coast but Bentong as well. Bentong will be a satellite town with an organised and planned development. “People can live here and work in Kuala Lumpur, with Gombak only a 25-minute ride away once the ECRL is completed,” he said at the SK (Felda) Chemomoi annual general meeting here. Liow said the railway line had been a dream of the people and been planned during British colonial rule and former prime minister Tun Dr Mahathir Mohamad’s tenure but could not be executed. “But now we have the technology and the political will to carry out this project. The Government is committed to develop the east coast,” he said. 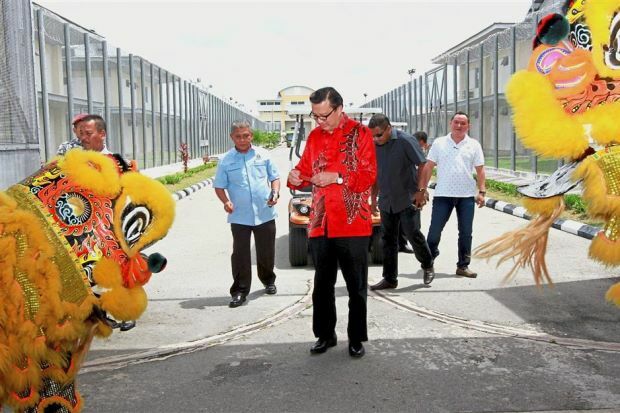 Liow being welcomed by a pair of lions at the bentong prison complex. Liow, who is the Bentong MP, also allocated RM20,000 for the school to hold its activities and approved another RM250,000 for the construction of a new hall. Later at a Chinese New Year celebration at the Bentong prison complex, Liow said the ECRL station had been proposed to be located near the town’s industrial park. “This will place Bentong as the centre where the Karak Highway and the CSR meets. Bentong itself is currently seeing double digit economic growth and putting the town at the centre of a junction will ensure more dynamic development,” he said. Liow added feedback from the public on the station’s location would be obtained and it was hoped that the groundbreaking could begin by the middle of the year. He also allocated RM10,000 for the prison to hold activities for inmates.